Joseph Dieleman, PhD, is an Assistant Professor of Health Metrics Sciences at the Institute for Health Metrics and Evaluation (IHME) at the University of Washington. In this role, he leads the Resource Tracking research team, which focuses on tracking development assistance for health, health spending by disease, and government health spending. 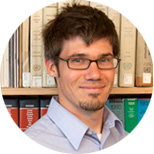 Dr. Dieleman's interests are the intersection of novel quantitative methods, health economics, and health policy. In addition to research tracking resources for health, he has ongoing projects assessing the financing needed for the eradication of malaria, bringing more attention to non-communicable diseases, and highlighting the role of social correlates of health. Dr. Dieleman is also passionate about teaching and mentoring students and research fellows. Dr. Dieleman studied at Calvin College in Grand Rapids, Michigan, earning his undergraduate degree in Economics, and at the University of Washington, where he received his PhD in Economics. He has also spent time living and working in Tegucigalpa, Honduras. Chang AY, Skirbekk VF, Tyrovolas S, Kassebaum NJ, Dieleman JL. Measuring population ageing: an analysis of the Global Burden of Disease Study 2017. The Lancet Public Health. 6 March 2019, 4: e159–67. doi:10.1016/S2468-2667(19)30019-2. Micah AE, Chen SC, Zlavog BS, Hashimi G, Chapin A, Dieleman JL. 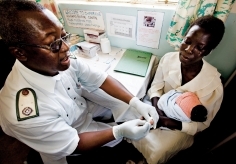 Trends and drivers of government health spending in sub-Saharan Africa, 1995–2015. BMJ Global Health. 13 Jan 2019;4(1):e001159. doi:10.1136/bmjgh-2018-001159. Micah AE, Zlavog BS, Chen CS, Chapin A, Dieleman JL. Donor financing of human resources for health, 1990–2016: an examination of trends, sources of funds, and recipients. Globalization and Health. 17 Oct 2018;14(1):98. doi:10.1186/s12992-018-0416-z. Lim SS, Updike RL, Kaldjian AS, Barber RM, Cowling K, York H, Friedman J, Xu R, Whisnant JL, Taylor HJ, Leever AT, Roman Y, Bryant MF, Dieleman J, Gakidou E, Murray CJL. Measuring human capital: a systematic analysis of 195 countries and territories, 1990–2016. The Lancet. 24 September 2018. doi: 10.1016/S0140-6736(18)31941-X. Global Burden of Disease Health Financing Collaborator Network. Trends in future health financing and coverage: future health spending and universal health coverage in 188 countries, 2016–40. The Lancet. 17 Apr 2018. Global Burden of Disease Health Financing Collaborator Network. Spending on health and HIV/AIDS: domestic health spending and development assistance in 188 countries, 1995–2015. The Lancet. 17 Apr 2018. Micah AE, Zlavog B, Friedman S, Reynolds A, Chapin AL, Schneider MT, Dieleman JL. The US provided $13 billion in development assistance for health in 2016, less per person than many peer nations. Health Affairs. 4 Dec 2017; 36:12. doi:10.1377/hlthaff.2017.1055. Dieleman JL, Squires E, Bui AL, Campbell M, Chapin A, Hamavid H, Horst C, Li Z, Matyasz T, Reynolds A, Sadat N, Schneider MT, Murray CJL. Factors associated with increases in US health care spending, 1996–2013. JAMA. 7 Nov 2017; 318(17):1668-1678. doi:10.1001/jama.2017.15927. Skirbekk V, Ottersen T, Hamavid H, Sadat N, Dieleman JL. Vast majority of development assistance for health funds target those below age sixty. Health Affairs. 2017 May; 36(5):926-930. doi: 10.1377/hlthaff.2016.1370. Charlson F, Dieleman JL, Singh L, Whiteford H. Donor financing of global mental health, 1995-2015: an assessment of trends, channels, and alignment with disease burden. PLOS ONE. 2017;12(2):0172259. doi: 10.1371/journal.pone.0169384. Dieleman JL, Baral R, Birger M, Bui AL, Bulchis A, Chapin A, Hamavid H, Horst C, Johnson EK, Joseph J, Lavado R, Lomsadze L, Reynolds A, Squires E, Campbell M, DeCenso B, Dicker D, Flaxman AD, Gabert R, Highfill T, Naghavi M, Nightingale N, Templin T, Tobias MI, Vos T, Murray CJL. US spending on personal health care and public health, 1996–2013. JAMA. 2016 Dec 17. Bui AL, Dieleman JL, Hamavid H, Birger M, Chapin A, Duber HC, Horst C, Reynolds A, Squires E, Chung PJ, Murray CJL. Spending on children’s personal health care in the United States, 1996–2013. JAMA Pediatrics. 2016 Dec 27. doi:10.1001/jamapediatrics.2016.4086. Hamavid H, Birger M, Bulchis AG, Lomsadze L, Joseph J, Baral R, Bui AL, Horst C, Johnson E, Dieleman JL. Assessing the complex and evolving relationship between charges and payments in US hospitals: 1996 – 2012. PLoS ONE. 2016 Jul 8; 11(7):e0157912. doi: 10.1371/journal.pone.0157912. Dieleman JL, Templin T, Sadat N, Reidy P, Chapin A, Foreman K, Haakenstad A, Evans T, Murray CJL, Kurowski C. National spending on health by source for 184 countries between 2013 and 2040. The Lancet. 2016 Apr 13. doi: 10.1016/S0140-6736(16)30167-2. Dieleman JL, Schneider MT, Haakenstad A, Singh L, Sadat N, Birger M, Reynolds A, Templin T, Hamavid H, Chapin A, Murray CJL. 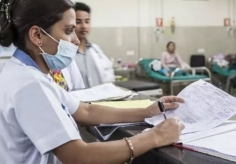 Development assistance for health: past trends, associations, and the future of international financial flows for health. The Lancet. 2016 Apr 13. doi: 10.1016/S0140-6736(16)30168-4. Schneider MT, Birger M, Haakenstad A, Singh L, Hamavid H, Chapin A, Murray CJL, Dieleman JL. Tracking development assistance for HIV/AIDS: the international response to a global epidemic. AIDS. 2016 Apr 13. doi: 10.1097/QAD.0000000000001081. Haakenstad A, Birger M, Singh L, Liu P, Lim S, Ng M, Dieleman JL. Vaccine assistance to low- and middle-income countries increased to $3.6 billion in 2014. Health Affairs. 2016 Feb 8. Bollyky TJ, Templin T, Andridge C, Dieleman JL. Understanding the relationships between non-communicable diseases, unhealthy lifestyles, and country wealth. Health Affairs. 2015 Sep; 34(9):1464-1471. doi: 10.1377/hlthaff.2015.0343. Olivier J, Tsimpo C, Gemignani R, Shojo M, Coulombe H, Dimmock F, Nguyen MC, Hines H, Mills EJ, Dieleman JL, Haakenstad A, Wodon Q. Understanding the roles of faith-based health care providers in Africa: review of the evidence with a focus on magnitude, reach, cost, and satisfaction. The Lancet. 2015 Jul 6. doi: 10.1016/S0140-6736(15)60251-3. Dieleman JL, Graves C, Johnson E, Templin T, Birger M, Hamavid H, Freeman M, Leach-Kemon K, Singh L, Haakenstad A, Murray CJL. Sources and focus of health development assistance, 1990–2014. JAMA. 2015 Jun 16. 313(23):2359-2368. doi:10.1001/jama.2015.5825. Haakenstad A, Johnson E, Graves C, Olivier J, Duff J, Dieleman JL. 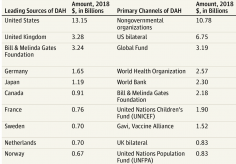 Estimating the development assistance for health provided to faith-based organizations, 1990–2013. PLOS One. 2015 June 4. doi: 10.1371/journal.pone.0128389. Bui AL, Lavado RF, Johnson EK, Brooks BPC, Freeman MK, Graves CM, Haakenstad A, Shoemaker B, Hanlon M, Dieleman JL. National health accounts data from 1996 to 2010: a systematic review. Bulletin of the World Health Organization. 2015 May 15. Article ID: BLT.14.145235. Dieleman JL, Yamey G, Johnson EK, Graves CM, Haakenstad A, Meara JG. Tracking global expenditures on surgery: gaps in knowledge hinder progress. The Lancet Global Health. 2015 April 27. doi: 10.1016/S2214-109X(15)70075-6. Graves CM, Haakenstad A, Dieleman JL. Tracking development assistance for health to fragile states: 2005–2011. Globalization and Health. 2015 March 19; 11:12. doi:10.1186/s12992-015-0097-9. Dieleman JL, Templin T. Random-effects, fixed-effects and the within-between specification for clustered data in observational health studies: a simulation study. PloS One. 2014 Oct 24. doi: 10.1371/journal.pone.0110257. Ng M, Fullman N, Dieleman JL, Flaxman AD, Murray CJL, Lim SS. Effective coverage: a metric for monitoring universal health coverage. PLoS Medicine. 2014 Sept 22. doi: 10.1371/journal.pmed.1001730. Dieleman JL, Graves CM, Templin T, Johnson E, Baral R, Leach-Kemon K, Haakenstad AM, Murray CJL. Global health development assistance remained steady in 2013 but did not align with recipients’ disease burden. Health Affairs. 2014 Apr. doi: 10.1377/hlthaff.2013.1432. Hanlon M, Graves CM, Brooks BPC, Haakenstad A, Lavado R, Leach-Kemon K, Dieleman JL. Regional variation in the allocation of development assistance for health. Globalization and Health. 2014; 10:8. Dieleman JL, M Hanlon. 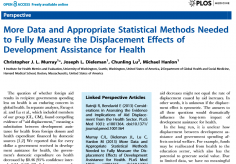 Measuring the displacement and replacement of government health expenditure. Health Economics. 2014; 23(2). Dieleman JL, C Graves, M Hanlon. 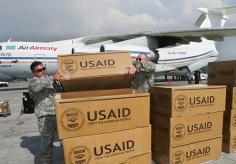 The fungibility of health aid: reconsidering the reconsidered. Journal of Development Studies. 2013; 49(12). Leach-Kemon K, Chou DP, Schneider MT, Tardif A, Dieleman JL, Brooks BPC, Hanlon M, Murray CJL. The global financial crisis has led to a slowdown in growth of funding to improve health in many developing countries. Health Affairs. 2012; DOI: 10.1377/hlthaff.2011.1154. In 2015, member states of the United Nations adopted the ambitious Sustainable Development Goals (SDGs), which included 17 global goals that targeted economic and social development. Goal 3, “to ensure healthy lives and promote well-being for all at all ages,” targets specifically marked progress in universal health coverage; improved access to safe, effective, and affordable medicines; and the end of the HIV, malaria, and tuberculosis epidemics by 2030. Although these goals can spur innovation, social and political commitment, and a drive to achieve greater health gains for less money, financial support is necessary to achieve them. Although knowledge about global health financing has expanded over the past two decades, major gaps remain. We know little, for example, about how much governments spend on major disease areas, how these amounts have evolved over time and how countries compare. A global health financing data revolution is sorely needed. The suite of papers that make up this special issue underline the importance of reliable information about financial resources for health. After more than a decade of immense growth, development assistance for health has flatlined. DAH fueled a scale up of antiretrovirals, insecticide-treated bed nets, vaccinations and a host of important global health interventions. Over the same period, the spread of a number of infectious diseases was reversed, reducing premature death and disability across the developing world. The plateau in international funding may threaten to slow progress or even roll back these gains. In The Lancet Global Health, Stephen Resch and colleagues’ study benchmarks 12 countries’ government expenditure on HIV/AIDS. This important research emphasizes that many governments are not meeting spending goals, and in many countries the financing gaps are so great that, even if they met the spending goals, expenditure would still fall short of what is needed (expenditure would cover only 64% of estimated future funding requirements, leaving a gap of around a third of the total US$7.9 billion needed). We reported that for every dollar a government received in development assistance for health, the government's domestic expenditure on health decreased by $0.46 (95% confidence interval: 0.24, 0.67). Subsequent research questioned those findings, including Batniji and Bendavid in PLOS Medicine who have since admitted mistakes in their statistical model. We argue that these subsequent studies fail to account for the complex, dynamic connection between domestic and foreign funding sources.